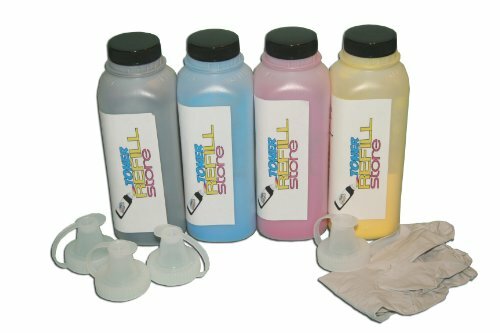 Toner Refill Store TM 4 Pack Toner Refill Kit for the Lexmark C500 . Toner specifically engineered for use on the following Cartridges & Printers. Lexmark C500 Lexmark X500 Lexmark X502 Lexmark C500H2KG Lexmark C500H2CG Lexmark C500H2MG Lexmark C500H2YG. Kit comes with 4 Bottles, Easy Instructions, Funnel Cap, Latex Gloves if needed; Toner Wipes- These cloths are chemically treated to attract toner dust. Each Bottle is good for at least the same page yield as a new cartridge, usually a bit more. Product is guaranteed to be same quality print, Bottle size may vary BUT gram load is always the same. Toner Refill Store offers a 100% Satisfaction Guarantee on all of its products! Feel free to give us a call if you have any questions.